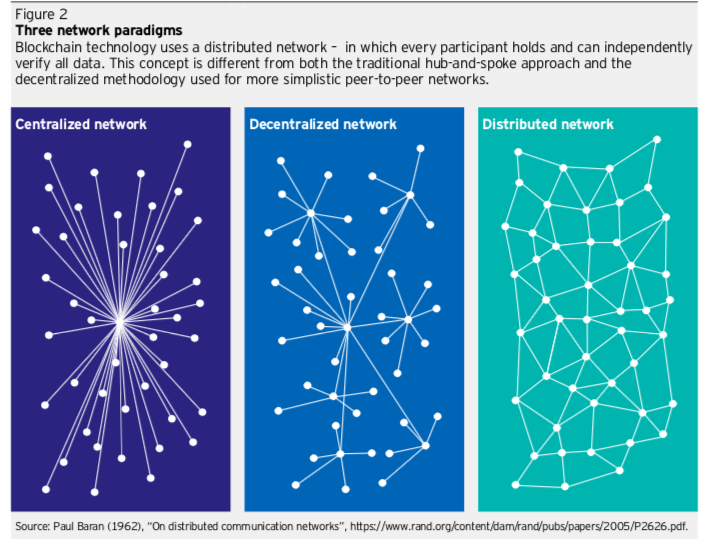 It’s potential stems from its structure as a decentralized, distributed digital ledger system. Blockchain can record transactions in a secure, verifiable and – importantly – permanent way. And in doing so, it can reduce costs, better mitigate risks, and create efficiencies in the system. The banking and finance sector has so far lead the way in leveraging the potential of blockchain. As a distributed database or ledger, it eliminates the need for a hub-and-spoke set up and lays the groundwork or peer-to-peer sharing and transacting. That has huge potential for banking and investing: a distributed system allows every participant to host a copy of the ledger and independently verify the integrity of the data at any time (see figure 2). Following a shared set of rules, every participant within a blockchain system validates all changes (new transactions) and recreates the ledger independently. That means transactions are accepted only after validation by a majority of participants, which mitigates the risk of a single point of failure in the system. Trading, settlement, clearing – Blockchain opens the door to doing things not just better – but altogether differently. Today, the standard settlement cycle for many investment vehicles is two days. However, by limiting the need for intermediaries – central counterparty clearing and central securities depositories foremost among them – blockchain enables near-real-time settlement, making T+0 a reality. Smart contracts – Smart contracts are code that automatically executes a transaction or other protocol when triggered by an event or an absence of sufficient inputs. A user can specify that funds cannot be transferred until required information is provided. Or that a payment can’t be made unless an asset has been transferred within an allocated amount of time. Smart contracts are powerful because they’re governed by programmatic rules and their execution is recorded on the blockchain, providing a transparent and auditable accounting trail. They have the potential to lower barriers to entry and fees for investors large and small. Plus, they can be used in any situation that necessitates a contractual arrangement to establish trust and security. In situations where counterparty risk is a feature, blockchain could be a game changer, including in the derivatives space and in the identification of potential money laundering or suspicious behavior. 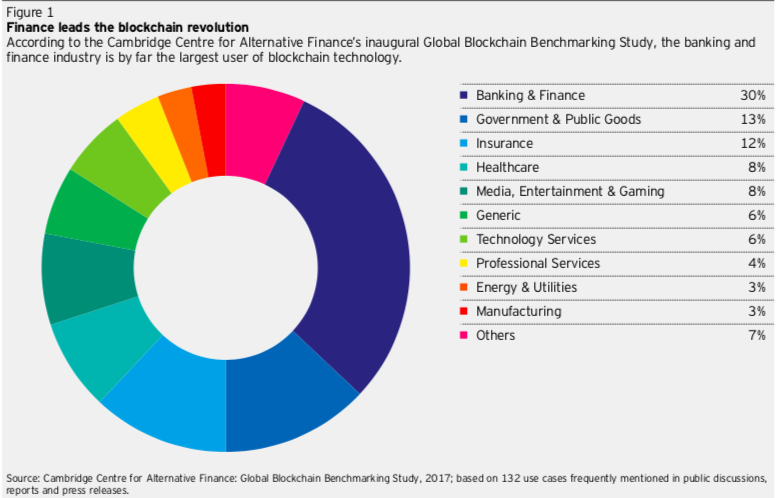 Fund data and trading – Blockchain is already revolutionizing how investment managers process mutual fund index data. Tests have shown that blockchain increases the speed of data delivery and can cut out the errors that can occur when information is inputted manually, like, for example, the names and share prices of companies. It has been suggested that a new generation of ETFs, dubbed blockchain-traded funds (BTFs), might further elevate disintermediation – and perhaps disruption. BTFs could allow trading to occur without the involvement of custodians, exchanges, banks and other trusted third parties traditionally pivotal to the process, thus opening up a 24×7 trading cycle. Democratization of investing – Tokens are central to the blockchain. Tokenization can serve as a model for digitally representing physical assets that can then be traded via the blockchain. For investors dealing with illiquid assets that are difficult to transfer or subdivide, tokenization could make the buying, selling and trading of relatively illiquid alternative assets, such as direct real estate, diamonds and fine art – and even intangible assets such as financial indices, patents and copyrights – a relatively simple task for investors of all kinds.